The Sheraton Hawaii Bowl is usually played on Christmas Eve, December 24th at 2pm local time (8pm EST), in the Aloha Stadium in Honolulu and televised on ESPN. That is consistent with it always being played either on Christmas Eve or Christmas Day. Started in 2002 the match-up features a team from the Conference-USA or Pac-10 and a team from the WAC (Western Athletic Conference). 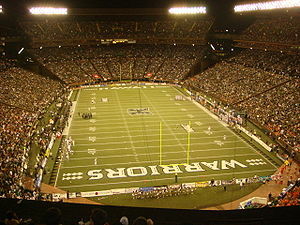 The Bowl succeeds the Poi Bowl (played from 1936-1939), the Pineapple Bowl (1940-1941, 1947-1952), the Aloha Bowl (1982-2000) and the Oahu Bowl (1998-2000) as bowl games played in Hawaiʻi. Southern Miss enjoyed a great win in the 2011 Bowl in front of 32,630 spectators. The game was played on Christmas Eve, 12/24/2011 at 3pm local time (8pm EST) on the Hawaiian Airlines Field at Aloha Stadium, matching-up Nevada Wolf Pack (7-6, 5-2 WAC) and the Southern Miss Golden Eagles (12-2, 6-2 C-USA). Although a defensive struggle for both teams and a 17-17 score in the 3rd quarter, the Golden Eagles were able to pull away with one more touchdown with 5:48min left in the game. They could hold on to their lead in an overall record low games with 'only' 41 combined points. This win also gave Southern Miss their 1st 12-win season ever. The Tulsa Golden Hurricanes enjoyed a blowout win of the 2010 Bowl. The game was played on Christmas Eve, 12/24/2010 at 3pm local time (8pm EST), matching-up the Hawai'i Warriors from the University of Hawai'i at Mānoa and the Tulsa Golden Hurricanes, representing the University of Tulsa. Tulsa looked like the better team from the start. Tulsa's defense looked scary at times. Even when Hawaii was driving down the field, the way Tulsa swarmed the ball and nearly picked off so many passes was impressive -- of course the 5 interceptions were more impressive. The 2010 Hawai'i Bowl featured Nohelani Cypriano during the halftime show. Cypriano is an award winning Hawaiian vocalist with Na Hoku Hanohano Awards for "Best Female Vocalist," and "Contemporary Album of the Year." Besides the Sheraton Hotels on Hawaii, the Moana Surfrider, A Westin Resort & Spa is another one of the host hotels for the bowl. The 2009 Hawaii Sheraton Bowl was played on December 22nd, 2009 with SMU (7-5, making its 11th bowl appearance and first since 1984 when it played in the Aloha Bowl in Honolulu) winning over the Nevada Wolf Pack 45 - 10. The Mustangs tied for first place with Houston in the Conference-USA West Division with identical 6-2 league records. SMU, which finished 1-11 last season, is coached by former Hawaii coach June Jones, who is in his 2nd year at the Hilltop. Assuming the University of Hawaii is eligible for bowl game play, the school is guaranteed a spot. Before the event took on Sheraton Hotels as its title sponsor, this post-season college football bowl game was also called the Aloha Bowl and the Oahu Bowl. Those games were played in its place (1982-2000). The previous main sponsor in 2002 was ConAgra. They were known for giving away thousands of free hot dogs on game day. The Aloha Stadium in Honolulu can hold 50,000 spectators and was opened back in 1975. Buy Bowl Tickets now and be one of the enthusiastic fans at Aloha Stadium. Click on the links below to see comments and thoughts from other fans about how they experienced their first (or last - or any in-between) college football bowl game. They are all written by other visitors to this page. Which Sheraton Hotels are host hotels for the Sheraton Hawaii Bowl 2010?